Cricet Australia calls it a minor incident - Symonds didn't know that a meeting had been called. Doesn't quite match getting drunk and embarrasing yourself in a pedalo for me. they all have legit cricket links, being Indian I need to be careful - anything can be misconstrued as racial. 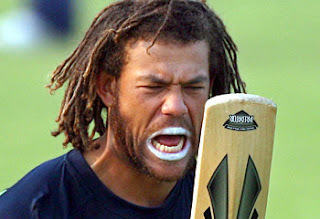 This is the funniest thing i've read about 'Birmingham Born Andrew Symonds' in ages! How macho of the guy..fishing? I do hope he will be present at Edgbaston next summer. Symonds caught Hook, Line Sinker. Val Blundell - if you live near Birmingham, perhaps a few suggestions of where Symonds can fish around that way would be helpful, for him and for England? wasn't that Bill Oddie's natural habitat? Perhaps he could give him some directions to pitch. (sorry you may be too young to remember them). Most definately...I will have plenty of tips for Roy during the summer of 2009 including a tour of the best drinking holes that he could frequent on a trip to his birthplace. Ok let's get one thing straight, Cod maybe common place (and i'm sure a good fish to catch in England) but here in the best country in the world he was out Barramundi fishing, quite possibly the best fish in the world. Over here eating cod is like eating sandpaper... with poo on it. Thanks for the graphic image of cod poo. Pleasant. What about Roy caught playing craps with Silver Jack? Or to illustrate my skills in maths: Roy + Barramundi + alcohol = no cricket. Or, Barramundi batters Symonds out of the ground. oomby dave, we don't have many opportunities to take the mickey out of you Aussies, so just a tiny little thing like Roy being born in Warwickshire..MY county, is a sweet little gem for me to role out every time he's in the headlines, it's made even more enjoyable by the fact that he doesn't like to be reminded of the fact. Please don't think for one minute that i am upset by your comment about 'big show' either. He would NEVER have been my choice for captain but unfortunately, there was no-one else in the running. Now that doesn't mean i would not get behind him. I just feel that it's too much too soon. Ok, he's done a good job so far but i really don't think he's had any situations that have tested his captaincy. I do see troubled times ahead, it happens to the best captains in the world. At the moment he can do no wrong, just wait until the wheel comes off because it will at some point. Wait and see how the wonderful media in this country will turn on him.